I teach photography one evening a week in the CWRU Art Studio program. The student and faculty relationships, as well as the challenges that teaching brings to my fine art and commercial photography practices, are nourishing. I taught at Case in the 70’s and 80’s and since returning to the faculty in 2010, I’ve been charged with the digital color courses. We initiated the Digital Color II course this spring. You can tell by the expressions on the students’ faces that there’s been a variety of responses to the course—from pleasure, to bewilderment, to questioning, to irritation, to sleep! 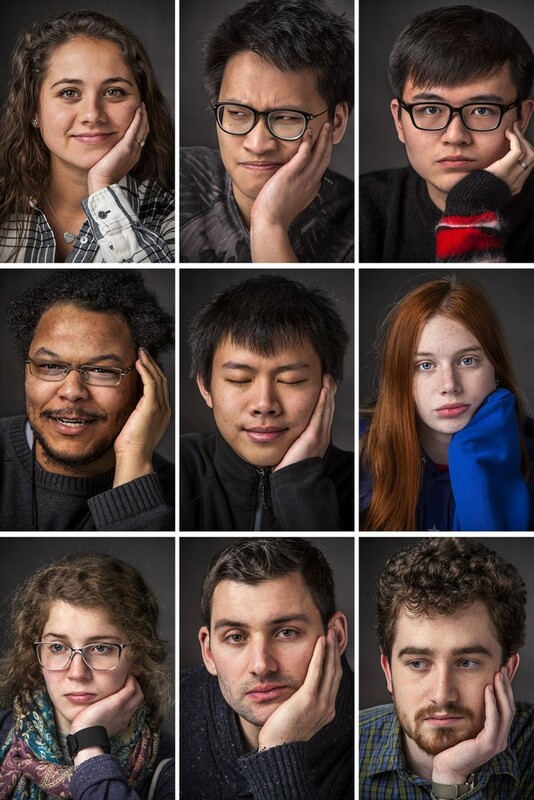 These portraits are the result of a recent studio experiment—the students were asked to place their left hand near or under their chin and I exposed one frame. The resulting composite of their portraits, all nine frames I made that evening, is unexpectedly satisfying.